Will Smith plays "Howard," the CEO of a successful NY advertising agency. A few years before the movie, he loses his daughter to cancer and falls apart emotionally. His friends are executives at the agency, and they're trying to keep it from going under. In order to do that, they need to prove Howard's emotionally unstable, so they can override his 50% voting shares. Here's something else the trailers leave out - these three are major characters. One's daughter hates him (ahem: LOVE), one is running out of TIME to have children of her own, and the last is secretly DYING. I'm not entirely sure I'm kidding about that last part. This is definitely a loose adaptation of A Christmas Carol, and the spirits are basically a 1:1 match with Dickens's creations. Regardless, they manipulate both their employers and Howard, pointing them in the directions they need to go. There's also a subplot with Howard interacting with the leader of a support group for parents who lost their children leading to yet another two twist endings. Several montages, a few thousand dominoes, four cups of monologues, six cups of platitudes; bake at 350 degrees for 97 minutes. The thing that bugs me about this is the premise actually is kind of cool. Having the spirits (or incarnations or whatever) simultaneously helping the lead and those around him makes for a neat spin on Dickens. It's also tough to argue with the casting choices: this should have been a home run. But, in case you haven't looked it up on Rotten Tomatoes yet, it wasn't. That said, the 12% score it wound up with is far harsher than it deserves. This is a flawed movie - hell, it's fair to call it a failed movie - but it's not at all awful. There are some solid scenes, and some cool character moments. Anyone who compares this to a Hallmark movie (I see a few of those in the review synopses) is either exaggerating or has seen far better Hallmark Christmas movies than I've sat through. 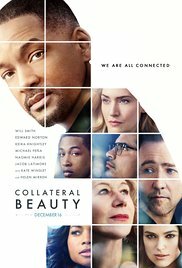 Collateral Beauty really isn't that bad. But... it's not remotely good enough to be a classic. And, frankly, this clearly wanted to be a classic. Hell, it feels like it's trying to be the next Miracle on 34th Street. In fact, it's trying way too hard. The tragedy is, had it tried less hard to be a powerful, profound look at the human condition, it might have succeeded in becoming just that. It needed more style, a lighter touch, and a brisker pace. Also maybe a script revision and better editor. Probably someone else in the director's chair, too. But the point is it could have worked. They could have given us the modern Christmas fantasy they set out to make, instead of the forced melodrama trashed by critics. There are far worse holiday dramas out there - FAR worse, in fact - but that alone isn't enough to justify watching Collateral Beauty. It is underrated, but not by as large a margin as I'd hoped.